Fig. 1. DNA sequence alignment of Sub1A-1 and Sub1A-2 for KASP marker development. 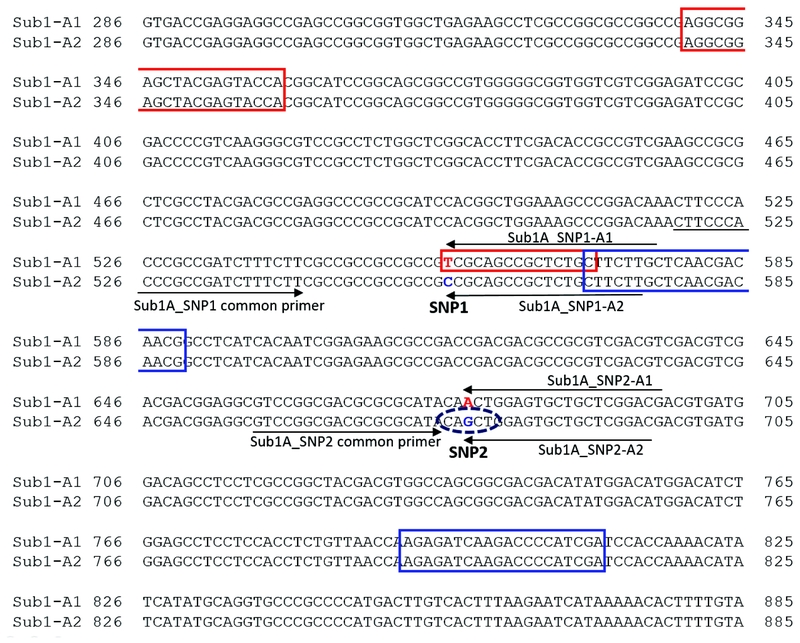 The alleles of Sub1A-1 and Sub1A-2 are distinguished by two SNP sites located at 556th (T/C) and 678th (A/G). AEX1 primers amplify Sub1A-1 allele only at SNP1 (556th, T/C), while GnS2 amplifies both alleles of Sub1A-1 and Sub1A-2 at SNP2 (678th, A/G), which includes the restriction site. Two KASP markers were designed to target both SNP1 and SNP2 sites, respectively. Red and blue boxes represent genomic locations of forward and reverse primers designed for AEX1 and GnS2 markers, respectively; dotted line represents restriction site of AluI or PvuII.